Bengaluru: In a strident attack on the Congress, Prime Minister Narendra Modi on Saturday termed its poll manifesto “anti-India” and playing with the future of the country. 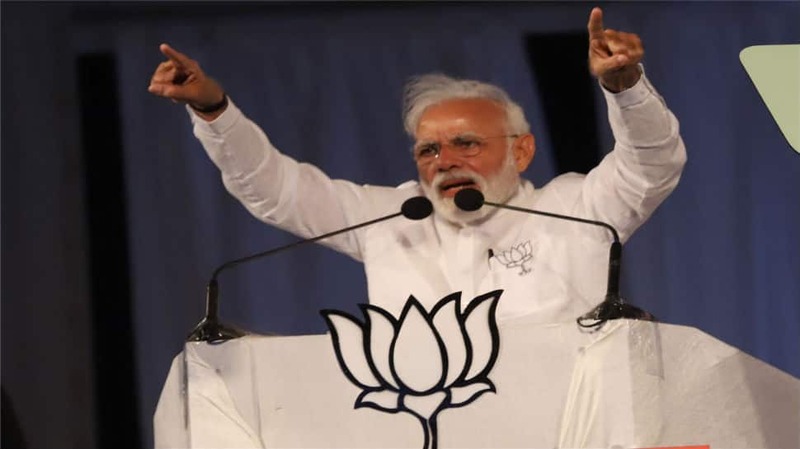 “The Congress, if elected, has promised to change the Armed Forces (Special Powers) Act (AFSPA) in Kashmir, which will weaken our fight against terrorism,” said Modi at a massive BJP rally here ahead of the Lok Sabha elections`s first phase in Karnataka on April 18. “The Congress wants to send our troops to the gallows by diluting the AFSPA and make the country`s border porous by withdrawing the army from J&K. Exhorting the electorate, especially the first-time voters and millennials to reject the Congress, Modi urged them to vote for the BJP`s lotus symbol to have once again a “mazboot” government than a “majboor” government of “unworthy parties”. “When we came to power with majority by your blessings, we ordered 2.8 lakh bullet-proof jackets to protect jawans at the borders from enemy fire, fulfilling a long-pending demand on which the Congress-led UPA government did not act though it was in power for 10 years,” he alleged. Listing achievements of his government during the last five years, Modi said the country progressed faster than it had over the decades due to its “clear vision, commitment, hard work and correct policies”. “I am not boasting but the results are there for all to see. Take any area or sector and compare its growth or development at a pace that was unheard of in the past. Be it infrastructure, power, roads, highways, railways, airways, ports, broadband, telecom, internet penetration and ease of doing business,” he said. “There will be a dedicated minister for fisheries when we form the government again after the general elections. Financial aid will be given for upgrading deep sea trawlers and fishermen will be equipped with Naval Messaging Receiver device to get alerts,” he added.